The latest TypeTastic School Edition update is now out with a significant change in the study material. Based on your feedback we have made it easier to understand which units you should assign for each grade level. We added more than 280 new activities for middle & high schools and students will now be taken to a specific theme based on the grade level. 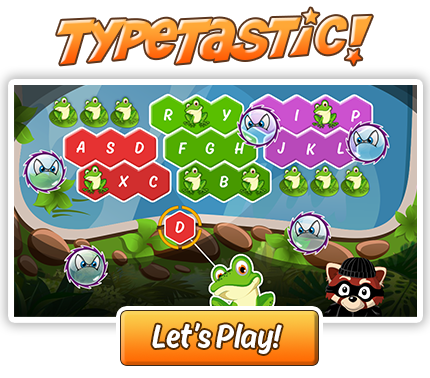 Hop on the keyboard with the original TypeTastic games and activities to kickstart typing in a colorful environment lead by our friend Roxy the Red Panda. The smallest of students can hear Roxy narrate the activities in units 2 and 3. The focus for lower elementary is to learn the key locations and motor skills required later on to type words and sentences. The three units included are perfect for kindergartners to 2nd graders to practice finger movements. The progress is gradual starting from one finger activities to get familiar with the keyboard, find key locations and to practice finger and eye coordination. The first activities are also compatible with a mouse which helps kids to practice mouse usage as well! All fingers aboard! Upper elementary students embark on an exciting island adventure through under-water reefs, serene beaches, dense rainforests, and rippling waterfalls. These six units challenge kids to learn the fundamentals of typing. The original FingerPaths keyboard helps young students to visualize key locations and finger movements. Gradual progress is present in upper elementary units as well with each lesson starting with a leisurely activity. Students are then moving on to type words, sentences and paragraphs. At the end of each lesson is a Skills Test which gives a benchmark in each lesson to track the students’ progress. Unit 4: Ready, Set, Type! Dig deeper into the secrets of fluent typing! We present six new units for middle & high school students with a streamlined blue theme. These units challenge students with complex words, build up their typing speed and help discover numbers and symbols. Varying activities are designed to support learning every step of the way. The new courses will undoubtedly help students become keyboarding champions. The older students will also benefit from customized typing tests that we recommend to be used as a benchmark for example at the beginning and the end of every unit.